Using Zendesk Support, you can monitor, and interact with Twitter accounts, and convert tweets into tickets. As an agent, you can reply to these tickets through Twitter, or by other means. Automatically convert Tweets you like into tickets. Automatically convert incoming direct messages into tickets to allow customers to reach you privately. Automatically convert public tweets that mention your Twitter handle (for example, @zendesk) into tickets. A ticket received from Twitter behaves like a normal ticket in most ways. You can update the ticket properties and comment in the same way you would on any other ticket. You can also add internal notes that the external requester does not see. When you reply to a ticket from Twitter, it will either appear as a direct message or a reply, depending on the type of ticket. For example, if the ticket was created from a direct message (DM), then your reply from within Zendesk will also be a DM. If the ticket was created from a tweet mentioning your Twitter account name (for example @Zendesk), then your reply from within Zendesk will be a reply tweet, threaded to the senders original mention. The only difference between a standard ticket and a ticket received from Twitter is the appearance and your reply visibility. When you reply to a ticket with a Tweet, you must stay within the Twitter character limit of 280 characters. Depending on the settings your administrator has configured, you might be able to choose to add a shortened URL to the Tweet that contains a link to the Support Ticket. Alternatively, your administrator might have configured this URL to be added automatically. See Appending ticket links to outgoing tweets. Even though your comments will appear as replies or direct messages to the requester, you can still see all comments in the Events field of the ticket. If you have connected Zendesk to multiple Twitter accounts, you might need to Select an account to reply from. If you have connected multiple Twitter accounts, replies by default will come from the Twitter account that first received the Tweet, mention, or direct message. However, you can choose which Twitter account you want to reply from. In order to choose an account to reply from, you need to have at least two twitter accounts set-up that have the option "Allow replies via this account". You can update the properties of a ticket from Twitter in the agent interface. This includes changing the requester. If you change the requester to a requester without a Twitter account, you will no longer be able to respond to the ticket using Tweets, or Twitter direct messages. The options to respond using Twitter will be grayed out. Alternatively, you can continue to interact with the ticket using email, or other channels you have configured. If your Zendesk supports multiple Twitter accounts, your admin can enable the Allow replies via this account setting, so you can choose an account to reply from. You can select a different account from the Reply as list box underneath your reply. The account the tweet or direct message was targeted towards will be selected by default. If your admin has enabled it, you can append a shortened URL to link the requester to the ticket. Alternatively, your admin might have configured Zendesk to automatically add the link. To append ticket links to outgoing tweets, check the Append ticket link box at the bottom of the ticket. 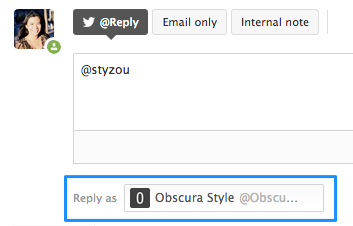 A shortened URL will appear in the reply or direct message, but not in the Events field. Note: If you started using Zendesk on or after August 21st, 2013, this option is not available until your admin activates Help Center. If this is the users first ticket, Zendesk creates a new user profile with the name of the Twitter account. The user will need to supply an email address and password to log in and access the ticket. If the user has previously opened tickets using Twitter, they must log in using their previous username and password. If the user has previously opened tickets by email, but has not used Twitter to open a ticket, their Twitter account will be linked to the account they previously created. Is it possible to reply to the original tweeter and @ another Twitter account to reply to more than one twitter account in one ticket? I double checked and it does look like you can @ mention another twitter account from the agent interface. You'll just have to manually type it into the ticket update but should render correctly once passed over to Twitter.